Originally written on May 24, 2016. Content was updated March 15, 2018. 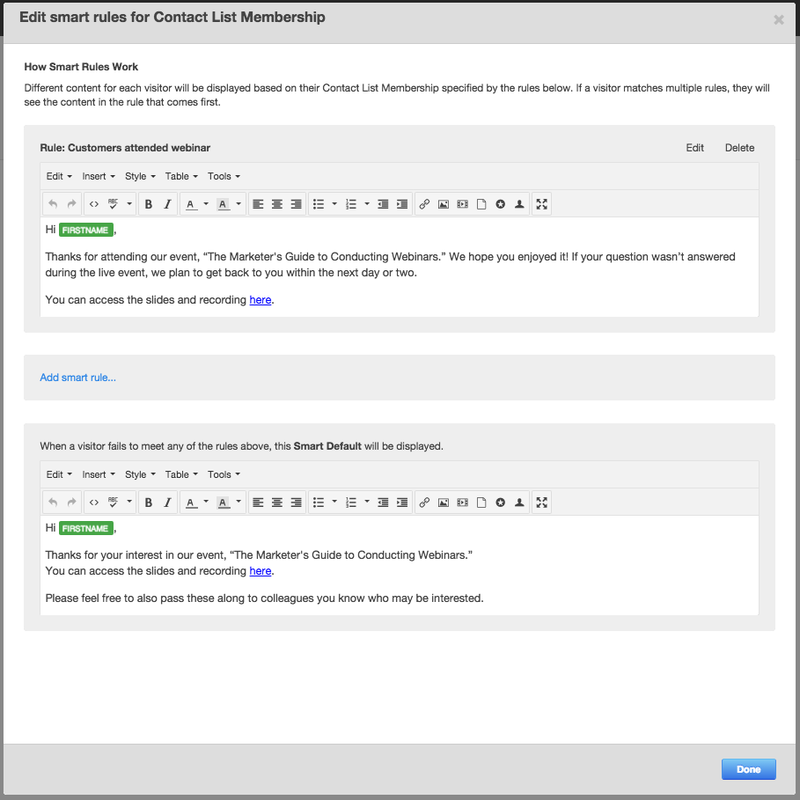 In one of my previous blog posts, “Guide to Setting Up Email Workflows for Webinars,” I mentioned that smart content is a great idea if you want to target your follow-up emails to multiple segments without creating multiple if/then statements in a multi-step workflow. 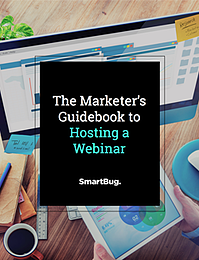 This blog post will cover how exactly to create those smart emails for both those who are using GoToWebinar and those who are using a different product. Thanks for attending our webinar, “[Title of Webinar].” We hope you enjoyed it! If your question wasn’t answered during the live event, we plan to get back to you within the next day or two. You can access the slides and recording here. Please feel free to pass these along to colleagues who may be interested. I would like to set up a call to see what you thought about the event and the industry in general. Does next week work for you? We also invite you to fill out this survey to let us know what you thought about the event and what topics we should cover in the future. According to our system, you weren’t able to make it to our webinar today, “[Title of Webinar].” We are sorry we missed you! If you are still interested, you can access the slides and recording here. Note: You can do this prior to the webinar taking place, which is nice. They will just be empty until the event is over. 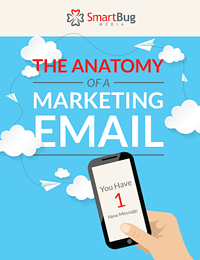 To make your emails smart based on webinar status, you’ll first want to create a Smart List. I start by making a list for my first segment (“Customers and Opportunities who attended the webinar”). Under “Segment contacts by…”, select “GoToWebinar webinar status” and then choose “Attended” and pick your webinar. You’ll then want to add an “and…” criteria and choose Lifecycle Stage as equal to Customer or Opportunity. Name and save your list, and you are done with the first one. You’ll repeat this process for lists #2 and #3 with other Lifecycle Stages as appropriate. For other products without native integration with HubSpot, you’ll need to import a list or lists in CSV format after the webinar is over (Contacts > Lists > Import button at top right). The first way is to have a new column for the contacts’ webinar status (attended or didn’t attend). 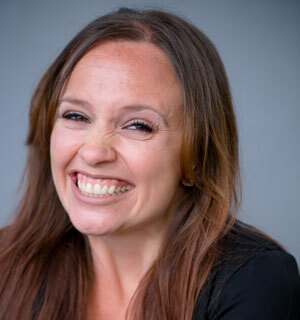 You’ll import this column as a new Contact Field in HubSpot, and if you want to keep statistics and cross-reference who attended what later, you will have to create a new field every time you have a new webinar. Which method you choose is up to you, but I recommend being consistent. Once you have imported your CSV file(s), you should make the four Smart Lists outlined above if you would like to also segment by Lifecycle Stage. A tip if you want to get everything ready to go before the webinar: Create your four Smart Lists, named for each of your four segments and with the Lifecycle Stage criteria selected. After the webinar is over, upload your lists, then go back and add the Webinar Status criteria to the Smart Lists prior to sending. Now that you have written your emails and created the lists, you are ready to create your smart email (Content > Email > Create new email button at top right). After finishing the default email, click elsewhere and then mouse over the body of the email and click on the orange smart button on the top left that appears. Choose “Contact List Membership” and then find your first list. A new dialog box will open with your rule on top (and a blank text box) and the default rule at the bottom. You will then put your email text in the empty box under your first rule. If you are planning to send this email via a Workflow, choose “Save for automation” under “Recipients.” If you are planning on sending it by hand, select your four lists on the left under “Recipients” by clicking the green “Include” button for each. You can then hit “Send” or “Save for Automation”! 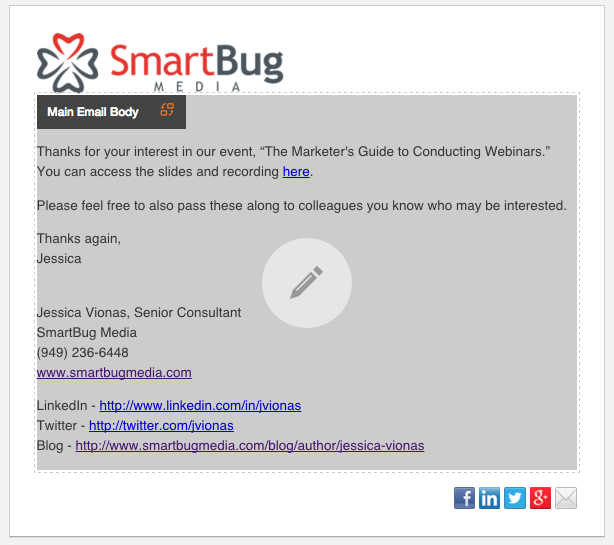 Smart Content in emails is an excellent way to segment your webinar attendees and non-attendees and deliver a customized message targeted to their experience. When you want this message to be laser-focused with four or more lists, Smart Content is the way to go. Any tips or tricks you’ve picked up for webinar follow-up emails?We'd love to hear them in the comments below.